The yurt - called Ger by the Mongols - is the traditional dwelling of nomadic families in Mongolia. It is composed of several orange mesh walls, all the same size and curved. The number of walls determines the size of the yurt, 3 to 5 walls in general, giving a floor area of ​​approximately 15 to 30m2. Two central posts, also orange and often richly decorated with symbols, bear a circle of wood that serves as a ridge at the top of the yurt. This circle of wood is connected to walls by a series of wooden slats, always orange, which remain visible inside the yurt, forming the ceiling. This wooden structure, formed by all the walls, center posts, the circle and the ceiling of slats, is covered with a felt layer whose thickness varies depending on the season. Felt, due to its insulating properties, can protect the family from both the heat in summer and cold in winter. We observed, in February, an indoor temperature of about 25 ° inside the yurt, thanks to the combined virtues of the felt and the stove for outside temperatures of -40 °! The felt is then covered with a white cotton cloth, possibly decorated to improve its water resistance. The whole structure is solidified with long straps made of braided horsehair. The wooden entrance door is always richly decorated. Inside the yurt, a wooden floor and carpets isolates the inhabitants from the cold and soil moisture. Like all the wooden parts of the structure, furniture of traditional Mongolian yurt is painted in orange, with colorful symbolic designs inspired by nature. Beds, also used as sofas, are positioned left and right of the door. Opposite the door, you can find a third bed or a cupboard on which is often installed the family altar and pictures and objects to which the family is particularly close. Coffee table and small stools are disposed opposite to the door, on the other side of the center posts. Between the central columns is the stove, center of family life, on which the mother cooks, and which delivers its heat during the long cold winter in Mongolia. Just left of the entrance door is sometimes a small cabinet with a sink, topped with a water reserve, where you can wash your hands upon entering the yurt. Contrary to what might suggest its external form of closed cocoon, the inside a Mongolian yurt is very bright because the central circle is only partially covered with felt, to make way to the stove pipe. Sunlight falls very naturally and pleasantly from heaven! "They put their houses on wheels, and woven rods are used as walls for their homes. The walls are enclosed on the top forming the roof of the house. They are covered with white felt and it is often coated with lemon or bone powder to make it sparkle. They sometimes put on the roof opening a black felt decorated with beautiful designs on different themes. At the entrance of the house, they hang a felt covered with colorful fabrics, and vines, trees, birds, and animals are reproduced in colored felt. " Note that at this time, the wooden door did not exist and a thick curtain of felt replaced it, but apart from this element, the basic structure of the yurt remains the same. At that time, marked by numerous wars of conquest, yurts could be installed on large carts pulled by yaks, to facilitate travel without having to dismantle and rebuild them, even if this operation is relatively fast. The yurt is the symbolic form of the link between the Mongolian people and the extreme nature in which he lives, which is the basis of shamanism and Tengrism, spiritual practices prior to the arrival of Buddhism. 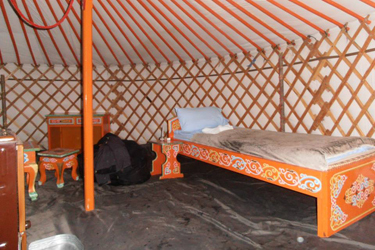 The yurt is a reduced form, a symbol, of the Mongolian cosmogony, the world representation for Mongolian people. 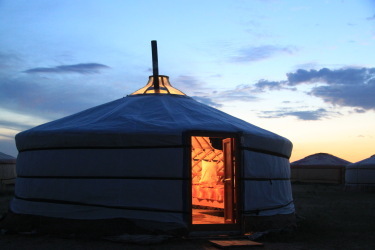 As such, in reference to the sacredness of nature and the spirits that inhabit it, the yurt is itself considered a sacred space, and many rules must be respected when entering the home of a Traditional Mongolian family. Its round shape evokes the sky, the central pillars, particularly respected, symbolizing the cosmic axis, the connection between earth and heaven, root of all spiritual practice. The fire is placed in the center of this representation of the universe, and many beliefs attached to it. It is the first element being installed during assembly of the yurt, and it was previously placed on three stones that symbolize the father, mother and daughter, mother of the heirs. Fire is therefore strongly attached to the woman, who is responsible for its maintenance. Note that belief that "a misfortune circle must always be between two circles of happiness" governs the manufacture of the stove, which should always be made up of three circles of metal. This same belief about circles of happiness and unhappiness is reflected in the development of Shiniin Idee, this kind of "wedding cake" made of cookies and sweets typical of Tsagaan Sar, the Mongolian New Year. It always has an odd number of stages of biscuits. Orientation responds to specific instructions. 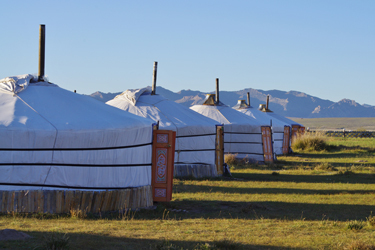 In Mongolia, the door of the yurt should open in the South, while among the Altaic peoples, it opens to the east. Several explanations can be found in this difference in orientation. The first considers all people put the entrance to the yurt to the sun, the Mongols taking the solar star at its zenith, not sunrise. A second is related to the history of the Mongolian people and argues that the Mongols would thus face the peoples of the South, their historic rivals for centuries.